Russian Deputy Defense Minister Anatoly Antonov. The Russian Defense Ministry is ready for consultations with the colleagues from the Baltic and Scandinavian states, as well as with representatives of Poland on removal mutual concerns caused by the near-border military activities, Russian Deputy Defense Minister Anatoly Antonov said on August 1. He said Russia is "ready for joint work aimed at preventing sea and air incidents based on the bilateral agreements in this sphere, as well as consultations with the defense departments of Latvia, Lithuania, Estonia, Poland, Sweden and Finland on removal mutual concerns caused by the military activity in the near-border areas." 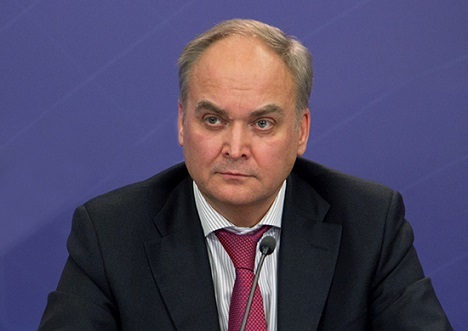 At a meeting with the foreign military attaches that was held on July 29, Antonov said Russia proposed to review the previous military programs implemented in the NATO-Russia Council (NRC) format. "The Russia-NATO Cooperative Airspace Initiative (CAI) revival would promote safety of aviation flights," he said. "The Russian Defense Ministry proposed to develop the exchange of views among the military departments on the terrorist threat primarily for countering the spread of the Islamic State (banned in Russia) terrorist group and other terrorist organizations," Antonov added. According to him, representatives of NATO countries have been invited to the Russian Defense Ministry events, including to the International Army Games that kicked off on July 30 and the Army 2016 military technology forum that will be held in early autumn. "It is planned to attract the accredited in Moscow military attaches as observers to the most significant episodes of the Kavkaz 2016 exercises that are planned for September," the deputy defense minister said. A meeting of the NATO-Russia Council was held in Brussels on July 13 after the NATO summit in Warsaw.